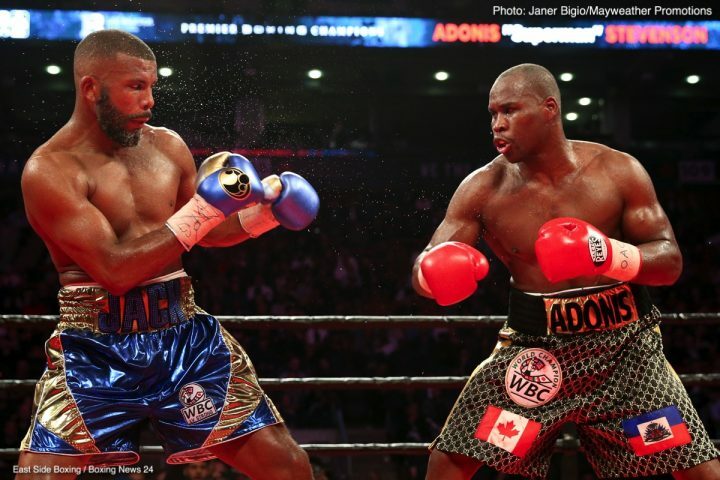 By Donavan Leonard: This past Saturday, WBC Light Heavyweight and lineal champion Adonis Stevenson (29-1-1, 24 KO’s) battled Badou Jack (22-1-3, 13 KO’s) to a hotly contested draw. The consensus opinion was that Stevenson dominated the early rounds, while Jack fought back to win the majority of the late rounds. Though not a candidate for fight of the year honors, it was an intense bout full of two-way action. The final verdict was unsatisfying for both Stevenson and Jack, but it did accurately reflect the inability for either man to pull away from the other. Although neither pugilist left the ring with a win added to their respected ledgers, they both walked away with an even greater amount of respect from the boxing world than with which they had begun that night. Jack entered the contest with arguably one of the most impressive resumes in the game over the past three years. Included in his list of victims (or those who were recipients of questionable scorecards) were Anthony Dirrell, George Groves, Lucian Bute, James DeGale, and Nathan Cleverly. With each bout he had shown improvement, a vicious body attack, and had started to be mentioned in the pound-for-pound discussion. Questions remained in large part due to his first-round knockout at the hands of unheralded Derek Edwards in 2014, and that Stevenson had displayed “Superman”-like power in his straight left hand. Jack had also recently moved up from 168 to 175, and although the win over Cleverly was a nice first step in the division, Stevenson, the linear champ, was rightfully considered a much more difficult opponent. Jack proved to be up to the challenge. He started off patiently, too patiently, reminiscent of Henry Wharton vs. Nigel Benn. Most likely his strategy was to avoid Stevenson’s vaunted power while he was still fresh and wear him down over the second half of the bout. He was successful in taking Stevenson to a place where he had not been in quite some time–the second half of a bout where he was not necessarily in control. Jack was dictating the pace and placement of the bout and was landing shots to both the body and the head of Stevenson. Except for a few (although very precarious) moments, he dominated the second half of the bout. Few would disagree that if there was a 13th round, Jack would have either won by knockout or would have earned the last point needed to wrest the crown from Stevenson. In this bout, Jack proved that he belonged in the conversation of the elite in the 175-pound division. His body punching would surely trouble Sergey Kovalev, and his vast experience against championship-caliber opposition would make it difficult to pick against him against either Dmitri Bivol or Oleksandr Gvozdyk. Although he was held to a draw against Stevenson, the “Ripper” had Stevenson holding on for dear life in the final round. Jack may not be the best fighter in the division—but somebody will have to defeat him to prevent him from rightfully having a claim to the title. Stevenson looked more like a champion after 12 round with Jack than he had over the past four years fighting mediocre opposition and disposing of them as was expected. The first six rounds of the fight were almost all Stevenson. Some of that was due to Jack’s deliberate plan of attack, but the jab, threat of the powerful straight left, and enough right hooks to keep Jack honest all belonged to Stevenson. He was not able to hurt Jack early, but halfway through the bout Stevenson was making Jack look very pedestrian. But then the going got tough, and Stevenson showed fortitude not previously displayed. As Jack peppered him with body shots and right hands to the head, Stevenson appeared to be slowly wilting. A generous amount of holding allowed by the referee enabled him to shorten rounds, but there still seemed to be too much time and too much Jack for Stevenson to survive. Stevenson did survive, and the bloodied, battered champion dug deep in the 10th round to give Jack some of his own medicine. A debilitating body shot in the 10th stopped Jack in his tracks, and a follow-up assault by Stevenson in the 11th seemed to be just the amount of offense he needed to prevent being overrun. Again, too much holding ignored by the ref in the 12th round allowed Stevenson to literally hang on to his title. Although the last image of Stevenson by many who watched the bout may be the exhausted Stevenson taking shots from Jack and doing everything except fighting, he must surely be appreciated for showing the toughness that many felt he lacked. Stevenson might have run low on gas in the second half of the fight, but had he not stood his ground in the 10th and 11th rounds, his belt would have been handed to Jack on Saturday night. At 40 years old, Stevenson showed grit, late-round power, and the wisdom to do whatever the ref wouldn’t penalize (excessive holding) to show that he was still king of the hill. His vulnerability will be a source of hope to his opponents, and perhaps Gvozdyk will get the next shot at the title. However, their confidence may well be their demise. It took a great fighter like Badou Jack to push Stevenson to the limit. Any overconfidence and the straight left that didn’t land on Jack could very well put them down and out. Stevenson and Jack fought to a draw, and rightfully there was no loser in this bout. A rematch has been discussed, but that is not a certainty. Gvozdyk appears to be clamoring for his shot at Stevenson, which would make an excellent bout. Whether it is Jack or Gvozdyk, or perhaps even a grudge match with Kovalev, it is refreshing to have Stevenson matched with live opponents. He proved he is still a force, and not a paper champion who folds when things start to go awry. As for Jack, if he does not get a rematch, he has certainly earned an opportunity to face any of the other belt holders—Sergey Kovalev, Dmitry Bivol, or Artur Beterbiev, in what would certainly be a treat for boxing fans, and a difficult challenge for the titlists.